The President of the Italian Republic, Giorgio Napolitano, live from the Quirinale during the conference "The State of the Union" (Sala de' Cinquecento). Article by Francesca R. Romano for the International Survey: Bulgaria-Italy of Novinite.com (Sofia News Agency) on the first edition of the "Festival d'Europa", Florence, 6 -10 May 2011. 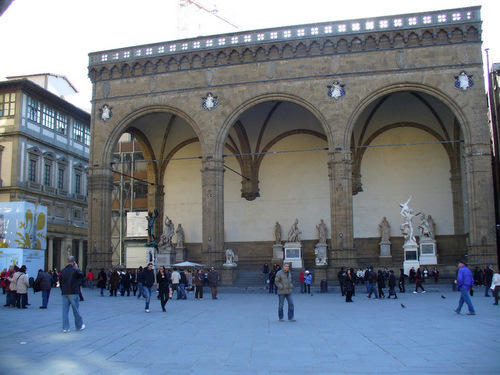 "Florence as one of the European Capitals": with these words Josep Borrell, 22nd President of the European Parliament and President of the European University Institute since 2008, has inaugurated the First Edition of the "Festival d'Europa", last May 6. Some of the most important European leaders met in Florence to debate on European Union and its future, after the significant changes introduced by the Treaty of Lisbon: the President of the European Parliament Jerzy Buzek, the Vice President of the European Commission Antonio Tajani, the Italian Minister for Foreign Affairs Franco Frattini, the European Commissioner for Education Androulla Vassiliou, the EP President of the Constitutional Affairs Committee Carlo Casini, and Lorenzo Bini Smaghi, Member of the Executive Board of the European Central Bank have participated in the main festival's event, the conference "The State of the Union". 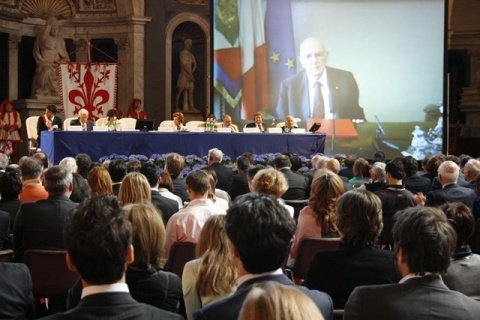 The first day of the conference (May 9), also Giorgio Napolitano, President of the Italian Republic, came in the debate, live from the Quirinale. 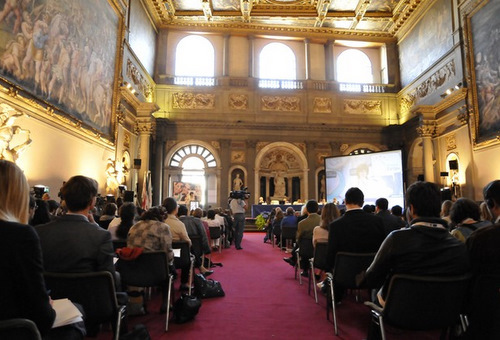 The conference has been held in the magnificent Sala de' Cinquecento in Palazzo Vecchio, historical seat of the Municipality of Florence, on May 9 and 10, in the presence of representatives of the Italian and European political and economic sectors, academics, experts, journalists and large audience. Commenting the event, the Italian Minister Frattini declared that "with the new developments in terms of external action and the Economic and Monetary Union, the Treaty of Lisbon shows its vitality. Thus, Europe has got all the instruments suitable to play the role of global operator which it aspires to. We are happy that this occurs and denies the clich? of the European decline. Europe is enduring the blows of the crisis. Europe is alive". "Having been President of the European Parliament, I know the importance of a higher knowledge of the Union to ensure a deeper participation of citizens in the EU decision-making processes", declared Borrell explaining the significance of the Florentine event. Not many people know that, but the building of the Europe of tomorrow has been studied and planned for years on the Florence hills. 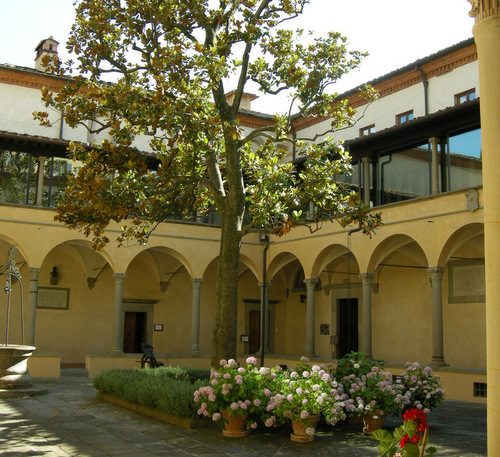 All this thanks to the European University Institute (EUI), an institution financed by 20 EU Member States and the EU itself, with its offices at the Badia Fiesolana in San Domenico. The research centre for social studies was established in 1972 by the Member States of the European Community, with the purpose of running PhD courses on European issues. To bring Europe and the EU values to Florence and to convert the city into a workshop on European issues and opportunities, EUI has conceived and promoted the "Festival d'Europa", which has given to the cradle of Renaissance the opportunity to be promoted on an international level, and not only for its natural capacity to attract tourists from all over the world, but for its new role of European capital, which definitely corresponds to an "original" vocation of being the ideal place for international debates. EUI, in fact, has just given birth to an appointment that is not meant to be a single event in Florence, but bi-annual, with the absolute intent of capturing the attention of a wide public, and not only the usual academic audience. That's why the Festival has been developed in 5 project areas (Institutional, Academic, Didactic, Socio-Economic and Cultural), to each of them corresponded dozens of events which have attracted hundreds of people, resulting in a big success. The main event conceived for the institutional area has been the conference "The State of the Union, during which the illustrious speakers has focused on significant issues like the role of education in the future of Europe, the enlargement as a possible obstacle to the political deepening, the role of Europe in the globalized world, the national diplomacies and the European External Action Service (EEAS), the relations between European Union and the United States of America and the burden of global responsibility, the Euro and the current monetary and financial situation in the Euro area. As to the academic area, it must be recalled the cycle of round tables on the "Cost of non-Europe", whose main issues have been the economic decline of Europe in the worldwide markets, the absence of a common foreign and security policy, the absence of a common energy and environmental policy, the limits and capabilities of the European taxation, the absence of a common policy on immigration and the myth of 'fortress' Europe. Sala de' Cinquecento in Palazzo Vecchio during the conference "The State of the Union"
In the didactic area, the arrival in Italy of the initiative conceived by the European Commission "Youth on the Move", has been one of the most significant moment of this first appointment of the "Festival d'Europa". "Youth on the Move" is aimed at improving access to the labour market through experiences such as fellowships and European cooperation programs, teaching exchange programs and volunteer activities abroad, and at raising young people's awareness on the importance of mobility in Europe to achieve better opportunities and to implement all the linguistic, professional and social skills which are pre-requisites for future employment. Its launch in Italy aimed at broadening the learning mobility opportunities for all young people to the year 2020. "In this period of crisis, - stated Androulla Vassiliou – our best investment is on people, allowing them to acquire the key skills to adapt and to face a rapidly evolving society. Mobility and adaptability are essential to provide a chance to each one of them. They must be the rule and not the exception. They provide young people with the possibility to improve their linguistic knowledge, to enrich their cultural background and to broaden up their horizons". On the socio-economic side, two conferences have been particularly interesting, both sponsored by the Chamber of Commerce of Florence and Promofirenze. One of them has debated over ways of bridging the gap between high level training and business needs, through the start-up of effective collaborations and links between enterprises and high level education as the key factor to provide young graduates with the skills required by European enterprises. The second conference has focused on cultural tourism as a tool aimed at enhancing the sharing of cultural traditions among European citizens. The two conferences have been complemented with a B2B event aiming at developing business relations between our enterprises and markets in the Mediterranean area. Among the many cultural events organized on this occasion, the Blue Night, the European version of the White Night, that took place on the night between May 7th and 8th with the participation of hundreds of young coming from all over the world; the Premio Galileo 2000 in the evening of May 9th at the Teatro della Pergola; and the show "Voci e suoni d'Europa", which took place on the night of May 6th at the Loggia dei Lanzi to celebrate the cultural identities of our continent. Among the richest events of the "Festival d'Europa" is to be recall the Maggio Musicale Fiorentino with the production of Aida as a "concert for Europe", held in the evening of May 7th at the Teatro Comunale. The cultural program included exhibitions – to be highlighted the exhibition on the historical cartography of the European borders at the Biblioteca Nazionale Centrale – meetings and debates – starting from the one promoted by the Fondazione Spadolini on the "role of Italy in the European integration" – activities for children, such as those proposed by the Istituto degli Innocenti, and shows. The 18th edition of the festival Fabbrica Europa exhibited some of the most interesting creations of the international contemporary scene at the Stazione Leopolda. 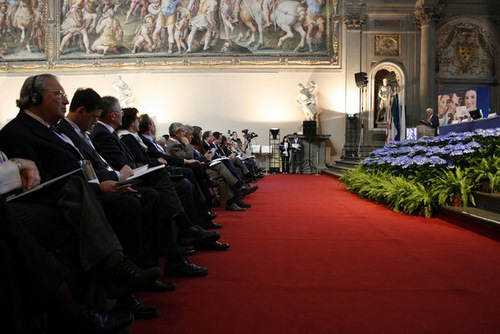 The organization of the event has involved the main local institutions: the Regione Toscana, the Province of Florence, the City of Florence, the University of Florence (whose Faculty of Political Sciences and International Relations is one of the most important in Europe), and the Chamber of Commerce.